The Estonian Presidency of the EU has complied with the EU agenda, by the holding of the event entitled “European Day of Remembrance for the Victims of Totalitarian Regimes” whereby equating Communism with Nazism. We are not surprised as in the ex-Baltic Republics, after seceding from the Soviet Union through the counter revolution of 1989 of Gorbachev and Co; the bourgeoisie took over and anti-communism became the order of the day in all of these Baltic States. We have also seen in recent times, the EU and US installing a Fascist regime in the Ukraine and the fragmentation of ex-Yugoslavia in the late 1980’s, through the connivance of NATO, and the Vatican. These attempts to put Socialism in par with fascism is has been going on for quite some time now. This however exposes the realities of today were Capitalism is a moribund system, thus it is attempting to make fascism look more palatable to the masses, as only through this Fascist revival the bourgeoisie can bring about hope for the survival of the Capitalist System and thus prolonging their hold on the political power that enslaves the working class to their system of capitalist exploitation. 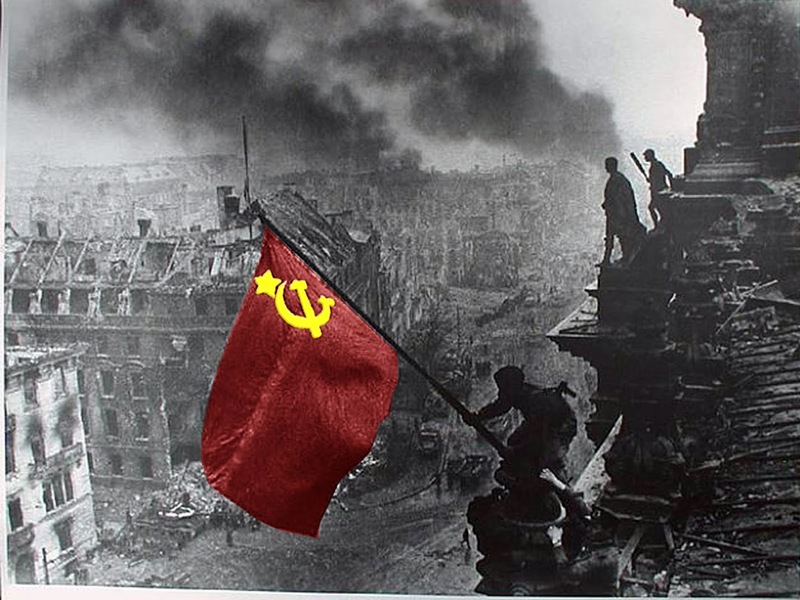 Equating Communism with Fascism is an attempt to rewrite history in order to exonorate Fascisn and make the younger generations forget all the achievements Made by the Soviet Union between the 1930’s and the early 1950’s and of the great victory over Fascism in the Second World War with the Soviet Union giving the main contribution towards this aim. Communism which is the end result of Socialism is for the betterment of the living conditions of the working masses while Fascism is for more profits for the wealthy few, thus it can never be on par with Nazism. The assumption that it is, is a complete lie that has to be jointly denied and strongly condemned. Only Socialism can bring hope to mankind to live in Peace and Freedom. The Communist Party of Malta believes that the controversy that is going on in Malta right now about the teaching of Islamic Religion in state run schools is a xenophobic, nationalistic, and a hysterically religious fervour which amounts to a fascistic attitude, that without hesitation the Party condemns. The Maltese Communist Party praises the position taken by the Maltese Government and also the Catholic Hierarchy for it’s’ support towards the solving of the problem of Islamic religious teaching to Maltese students that are of that faith. However many celebrations the EU organizes on the occasion of the 60th anniversary of its establishment, it cannot hide its imperialist character, its anti-people mission. The EU was not created in order to serve the interests of the workers but those of big capital. The goal of its establishment and criterion of the EU's strategy is the perpetuation of capitalist exploitation, the servicing of the competitiveness of European capital and its need for very cheap labour power without rights. For this reason, it has been demonstrated in practice that the celebrations about the prosperity of the popular strata which accompanied the founding of the EEC, the establishment of the EU and EMU, not only did not have any real basis for the peoples, but on the contrary conceal the full-scale assault against the workers'-people's rights. What had been won by the workers through harsh class struggles and the pressure exerted by the USSR and the other socialist countries are being taken back. In any case, it is no accident that the EU plays a leading role in anti-communism, the distortion of historical truth, the provocative identification of communism with the monstrosity of fascism. The political line of the EU thrusts the burden of the crisis onto the workers and along with the measures it implements for the recovery of the capitalist economy and the increase of the profitability of capital, stepping on the ruins of the workers'-people's rights. With this as the goal, new anti-people measures are being implemented and the mechanisms that support EU capital with new privileges, tax exemptions, subsidies are being multiplied in order to reinforce it at the expense of its international competitors e.g. USA, China, Russia. In the environment of the sharpening of the competition over energy resources, their transport routes and the control of the markets, the European monopolies play a leading role in imperialist interventions against Syria, Ukraine, Iraq, Libya etc. in order to impose their interests in regions of strategic importance. The EU and the governments of its member states further reinforce their military preparation through the European Defense Union, the Euro-army, the enhanced cooperation between the EU and NATO, the arms race, facts that bear witness to the strengthening of the danger of a generalized military conflict. 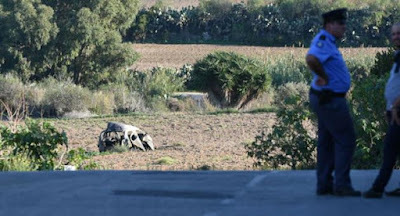 In the same reactionary direction, the EU and its member states intensify their mechanisms of repression, surveillance, profiling and intimidation of the peoples, with the basic aim of impeding the activity of the labour-people's movement. The peoples must be vigilant. They must not shed their blood in the wars for the interests of the imperialists, the major victims of which are the refugees. The working class, the poor popular strata in Europe have acquired a great deal of experience over the years; the only way forwards is to call the EU into question.It is being demonstrated that the EU is neither eternal nor inevitable. Whatever scenario is adopted "regarding the future of Europe", the peoples will suffer heavy losses. The European Communist Initiative (ECI) calls on the peoples to struggle and reject both the longstanding supporters of the EU, social-democrats and liberals, and also those that continue to sow illusions in name of alleged "fundamental principles of the EU that were later lost " or the of the anti-worker "acquis communautaire", like the forces of the Party of the European Left. At the same time, the ECI stresses that they must struggle to decisively isolate the managers and reserve forces of capital, such as the so-called eurosceptic, nationalist and fascist forces, which sloganeer with their positions about the EU and in practice aim to keep the people trapped in every country in the capitalist development path, seeking to undertake themselves the management and perpetuation of the capitalist system, representing sections of the bourgeois class. The working class, the peoples of Europe have the strength and can reinforce their struggle, fight for the recovery of the losses suffered during the crisis and in general the satisfaction of their demands on the basis of their needs, to come into conflict with the monopolies and the exploitative system, to chart their own path for their own power and economy which will serve their interests and satisfy their contemporary needs, to be liberated from the shackles of the EU and other imperialist alliances.The future of the peoples Europe is socialism, the only real way out of capitalist barbarity. The peoples must come into conflict with capitalist exploitation in a mass and organized way, must strengthen the struggle against the EU and NATO. 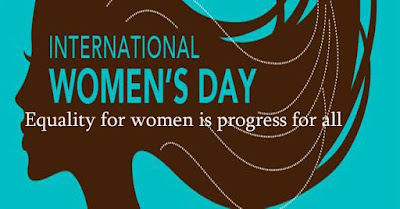 The Secretariat of the European Communist Initiative sends warm militant greetings, on the occasion of the International Women’s Day to the working women, unemployed women, women pensioners, urban and rural self-employed, to the young mothers, to the young women in university and school. It particularly salutes women refugees and immigrants, women from single-parent or large families, women with special needs and the mothers of children with special needs. Female work exploitation, employer intimidation, dismissals, abuse of women, are clear signs of a rotten system, capitalism, based on the exploitation, at a time when all the rights, previously obtained through decades of class struggle, are being rapidly canceled. The forms of gender and class discrimination continue to exist in every aspect of the economic, social, cultural life of women, as they are a source of additional profit for capital. They are utilized by all the bourgeois governments globally for the competitiveness of the monopolies. Inside this framework, the living standards of proletarian women are even worse. Women are the first ones to be fired, on the altar of the profits of big capital, they are underpaid in respect of men, they are forced to carry out a heavy work for free, or cannot access education because they cannot afford it, or endure violent cohabitation conditions just because they have no alternatives or simply do not know their rights. Women are forced to supply social and family care services in substitution of the public sector, which has downgraded social services provided by local government, various NGOs and “social cooperatives”. This is the strategy of the EU and its governments to reduce social services and infrastructure, shifting the burden onto the workers’-people’s income. Nevertheless, we are witnessing the ostensible paradox of women dying from exertion for 3 euros per hour or to stop looking for a job because they have enough of being continuously rejected. The current social system cannot give answers to these problems. The bourgeois-social-democratic and liberal- parties and collaborationist trade unions are using gender diversity to blur the consciousness of class diversity. There is no affinity between bourgeois and proletarian women and there can be no solidarity between those who carry out class oppression and those who are subjected to it. Gender oppression is a consequence of class oppression and a division of labor that is functional to it. Therefore, women's emancipation cannot be obtained in a way, other than through the general emancipation of labor. The right to permanent and stable work with rights, with a satisfactory salary and pension, to be provided with healthcare, assisted maternity and education are at the core of the contemporary needs of women and their struggles as a part of the general class struggle. Only a higher form of organization of society, with the overthrow capitalism and the establishment of socialism-communism can put an end to the double class and gender oppression of women. The women of the working class must not accept that the children of the working class, of the people, their children become victimizers or victims in the imperialist interventions for the interests of the monopoles. They must demonstrate popular solidarity with the thousands of refugees, amongst them women, infants, unaccompanied children and adolescents and isolate the racist poison. They must honor in this way the contemporary internationalist message of March 8th. History confirms this truth. One hundred years ago, the Great Socialist October Revolution achieved for the first time the full and real equality of women's rights, taking a decisive step for the emancipation of women. 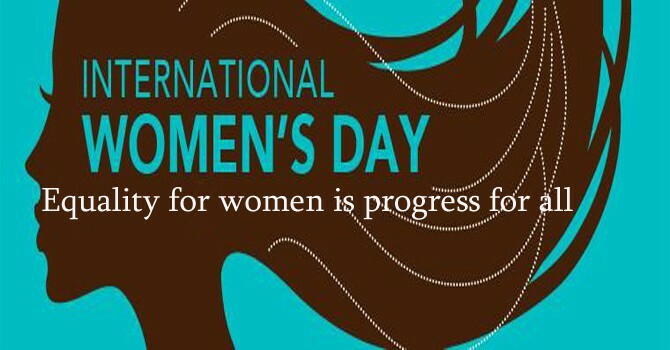 Therefore, March 8 should not simply be a celebration, but a day of political mobilization, marking the upswing of the struggle to win the contemporary rights and to satisfy the needs of working women and men, for a world free of exploitation. On the occasion of March 8th, we address this call to reinforce the struggles for the achievement of our common goals and we greet the working women of Europe and the world. Maltese Communists condemn EU agreement on Migration. The Communist Party of Malta condemns the agreement reached by the European Union in Malta on migration, to try to cut off the route from Libya into Europe. 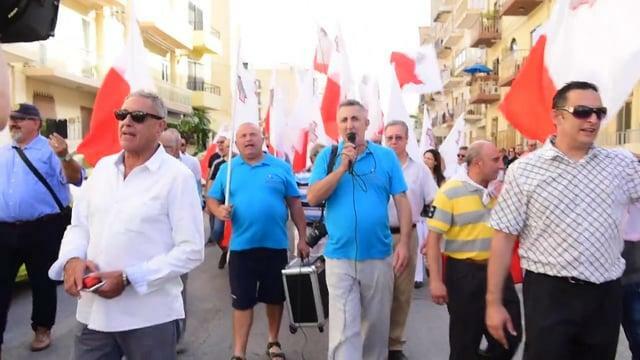 "The Party also condemns the two main parties in Malta for supporting the European Union, which is being hijacked by extreme right elements". The Communist Party of Malta urges all left and progressive forces in Malta to join together to show their disapproval to this agreement and the approval made by the Labour and Nationalist Party to this accord. 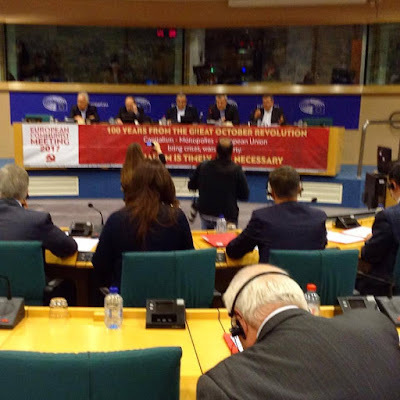 European Communist Meeting EU Parliament Brussels January 23rd 2017. One Hundred Years from the events of 7th November 1919. Communist Party Malta. 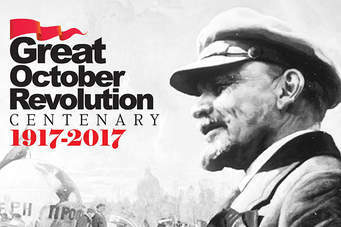 2017 is the 100 year anniversary of the Great October Revolution This Revolution took place in Russia on November 7th of 1917. This was the greatest event of the 20th Century; it was a step forward that shook the world from its foundation, it brought about great changes where Marxist theory was put to practice, and also left an indelible mark in the history of mankind. The salvation of humanity lies only in the transformation of the society into a Socialist Society. Over 100 years ago Roza Luxemburg said “either Socialism or Barbarism” and since the counter revolutions that took place in the Soviet Union and the Socialist Community in Eastern Europe, this statement rings true, as exactly towards barbarism capitalism has led us. 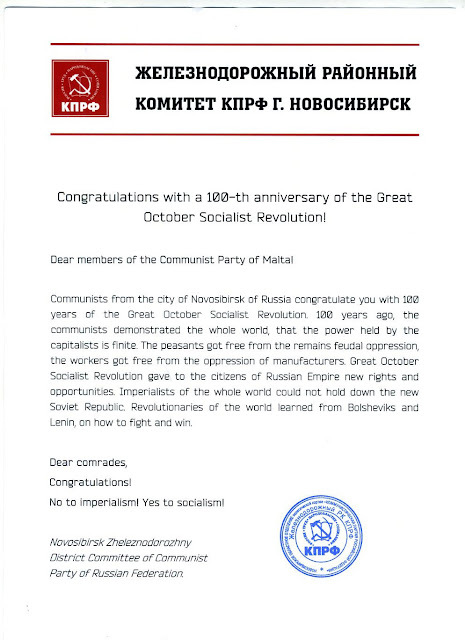 The Great October Revolution inspires and shows us the way forward in our struggles. The Socialist road embarked upon by Vladimir Lenin and his Bolshevik Party after years of ceaseless struggle, at last had led to the Great October Revolution of 1917. The call by Lenin “All Power to the Soviets” led the then oppressed Russian workers and peasantry into open revolt against the “Provisional Government that had replaced the Tsarist regime. This workers and farmers Revolution shaped the Union of the Soviet Socialist Republics from the 15 countries that formed the previous Tsarist Empire. The USSR was to become a state governed by the workers. Through its 73 year history proved that not only the working class could lead society but that is was also the bastion of the working classes in the Western Capitalist Countries. Through its people’s efforts and their leaders namely Joseph Stalin, with great personal sacrifices the Soviet people built up a mighty land that eventually was put to test during the Great Patriotic war, much greater sacrifices were required to ward off the German invasion of 22 June 1941. These Sacrifices included loss of 24 million soviet citizens, and the complete destruction of soviet cities and villages. However through its great contribution the Soviet Union was the leading force that assured the victory over Fascism in the Second World War. The achievements of the Soviet Union were evident needless to say the scientific accomplishments, speak for themselves. The Soviet Union was to become the champion of all countries that were oppressed by colonialism and was a catalyst in the liberation of all colonized countries It was the Soviet Union that supported Malta’s and other countries that demanded independence in the UN. The Second War was barely over new war clouds arose on the horizon, not satisfied with the Yalta Treaty, Imperialism with the aid of new weapons felt safe to challenge the Soviet Union. The Nuclear Armaments this time were the threat not only to the Soviet Union but to the whole of mankind. This threat was neutralised by the Soviet Scientists who also were able to develop nuclear armaments in a very short time. A stalemate position then ensued. This came to be known as the Cold War. This period ended in the late 1980’s with a supposedly disarmament treaty which also ended the Yalta treaty. Through the revisionism which had started during the Khrushchev period, and the weak leadership that ensued, plus the final internal betrayals of Gorbachev and Yeltsin, the counter revolution triumphed after 73 years, and the Soviet Union came to a sad end. Imperialism had triumphed and went on to break every treaty that it had made with the now defunct Soviet Union. Today we are living in a unipolar world the U.S. dictating its demands which are always in tune with its own interests, which happens to be everywhere. Capitalism today is in decay. The predictions, made by Karl Marx about its final collapse, have at last arrived. Fascist forces are arising out of capitalism’s foul decomposition. Fascism is the tool that the bourgeoisie uses when its position is threatened, and exactly this is what has resulting from the collapse of the capitalist system. The virus that infected this system started long before the short lived triumph brought about by the counter revolution of 1989 that led to the fall of the Soviet Union and Socialist Community in Eastern Europe. It was believed then that the disappearance of the Eastern Europe Socialist community and the Soviet Union will open new markets and give capitalism a new impetus thus ensuring its survival. Wars of aggression by the Empire and its NATO allies are being waged against third world countries in an effort to emerge from these crises by exhorting from them their natural resources. This however is not something new as in the 19th Century it was the old imperialist powers France and Britain committed such acts. However today this is a paradox, as these wars continues to deepen the crises by putting more demands upon the already empty coffers, and thus creating more hardships on the workers in western world who are expected to pocket the bill and on the workers of the third world who are expected to be the victims. This year all Communists and progressives around the world are celebrating the 100 years anniversary of the Great October Socialist Revolution. Today, though Soviet Union is no longer with us, through the internal betrayals by its last leaders. This should not hinder us. Our tasks and struggles today are to give Capitalism its “coup de grâce” and to reach the masses everywhere to build socialism on a global scale thus ridding the world of miseries, suffering, and wars.